Smartphones connect over peer-to-peer networks with ease. In fact, with the latest Android phones, you need only touch the backs of two handsets together to instantly start sharing data. With your car, the only peer-to-peer experience occurs when you touch the bumper of a Ford at your local supermarket. Fortunately, that's about to change, because an important car-to-car roadway test has now started in the US. The benefits of peer-to-peer car comms are obvious - you'd get realtime traffic, accident and weather updates, etc, live from cars all around you, enabling your sat nav to avoid tailbacks, dodge accidents and generally get you to your destination as fast as possible. In a world where roads are already overcrowded, this kind of tech will be vital in the years to come, in order to keep traffic flowing at optimum efficiency. In theory, this will eventually lead to car sat nav systems that plot and show you the locations of every car on the road in your vicinity. Of course, the Car 2 Car Communication Consortium in Europe has experimented with wireless transmissions between cars for some time. In late August, a new project started in the US that seeks to find out what happens when thousands of cars communicate with each other over a full year. The project, called the Safety Pilot Model Deployment, started on August 21 with 300 cars on a highway near Ann Arbor, Michigan. Eventually, 2,850 cars and trucks will participate. The project is a collaboration between the US Department of Transportation (DOT) and the University of Michigan. For the first time, a major trial will show if car-to-car communication can work under real road conditions. "This will demonstrate the technical maturity of the technology," says Don Grimm, a senior researcher at General Motors (GM). "While previous deployments were more experimental, this is the first time a trial is using production-like cars where regular drivers participate over a number of months." GM is one of eight car manufacturers participating, having 'instrumented' eight cars in a fleet of 64 from other automobile makers such as Ford and Nissan. The driver won't see any of the electronics but will use a dash interface which varies between car manufacturers in the trial. Other vehicles will use a device that is not embedded into the car but can still transmit and receive data. The idea is to provide more information about other cars and vehicles in real time. For example, the driver might see an alert that another motorist had to brake suddenly several kilometers/miles ahead, that there is a traffic jam along one stretch of roadway, or that one vehicle has collided with another. Drivers benefit from the aggregated data and can plan to slow down or change their route. Current vehicles use high-powered sensors to scan the surroundings and can sense an imminent collision, applying the brakes accordingly. For example, many BMW and Mercedes-Benz cars can brake to avoid a crash. However, these short-range systems only work 30m/100ft ahead of the car. The new trial uses a wireless radio spectrum called Dedicated Short Range Communications (DSRC) in the 5.9GHz band over a range of about 180-210m/600-700ft. 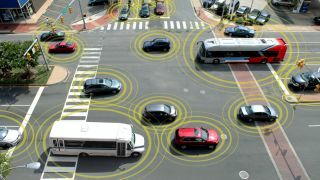 About 400 cars and trucks will be able to communicate with each other. In a mass roll-out, a server infrastructure installed by city and US federal entities could handle communication between thousands of cars at a time. DSRC was first introduced in 1999, but the Ann Arbor test is the first to use the spectrum for thousands of vehicles. The Ford Taurus Sho in the trial uses lights, tones, haptic sensations in the seat and lights in the side mirrors to warn the driver when there is a DSRC message. One interesting example of how the warning works differently from existing onboard sensors is when passing on a two-lane road.